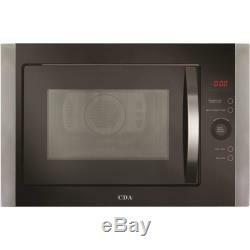 CDA VM451SS 900W 25L Built-in Combination Microwave Oven Stainless Steel VM451SS. DIMENSIONS: H 388 x W 594 x D 450mm. Stylish and convenient, the CDA VM451SS built-in combination microwave offers exceptional cooking power alongside your main oven, making it the perfect addition to any kitchen. Ideal for kitchens that are lacking surface space, the built-in design adds convenience to your cooking and productivity. The VM451SS is designed to be built into your kitchen, offering seamless integration within your cupboards and alongside your other appliances. Stainless steel and black in appearance, this combination microwave has an overall modern and simplistic appearance while also saving space on your counter top. The VM451SS provides cooking power in the form of microwave, grill and fan assisted functions. Through ten auto-cook programmes, you can enjoy excellent results from these modes individually and as part of a combination. The microwave element offers powers of up to 900W, great for smaller jobs. Fan assisted cooking modes provide an even distribution of air around the cavity, for thorough and even results. The grill is brilliant for quicker jobs, ideal for meat, fish or browning items. Combining different cooking modes, you can experience even greater results. Use the grill and fan functions to roast meats to perfection. Offering five power levels, the VM451SS can be tailored to suit your dish, delivering the best results each time. With ten auto-cook programmes, there's less to think about. Simply choose a programme to suit your dish, press start, sit back and relax. Touch controls give you quick and accurate adjustments to settings including time and power. The LED display provides all the information you need when cooking, including time remaining, power levels and more. An acoustic alarm notifies you when your dish is ready, so you can enjoy your freshly cooked results right away. To ensure your dish is cooked perfectly and to prevent any dangers, the control panel features a safety lock. Great for households with children, this lock prevents little fingers from adjusting the settings, as well as any accidental adjustments from knocks. 5 Microwave power levels: 900W max. Acoustic end of programme signal. Auto cook: 10 auto cook programmes. Maximum temp convention programme: 220°. Glass turntable - 315 mm. Bulb type: 25 W incandescent bulb. Power supply required: 13 A. Rated electrical power: 2.5 kW. 62 customers have bought and rated this product, giving it an average score of. Our success has been achieved though purchasing at highly competitive prices and passing the savings directly on to the customer. We'll take a look at your order and make sure that the products you have chosen are suitably matched. If we have any special offers or alternatives that we think might be a better suited, we'll get in touch to let you know and discuss the options over with you. If you'd like to pay by card, please have your e-bay user ID and item number ready and call 01484 448 969 with your card details. Nearly all orders arrive on time and in good condition but occasionally goods can get lost or damaged in transit, we do our best to prevent this by working the the highest quality couriers. The item "CDA VM451SS 900W 25L Built-in Combination Microwave Oven Stainless Steel VM451SS" is in sale since Saturday, February 27, 2016. This item is in the category "Home, Furniture & DIY\Appliances\Small Kitchen Appliances\Microwaves". The seller is "buyitdirectdiscounts" and is located in Huddersfield. This item can be shipped to United Kingdom.